CIBTech is always committed to maintain highest standard of workings whatever project it undertakes and work with never to compromise attitude. That's why we are and will always be looking for people having strong aptitude in their areas of working and will be nurturing them for our and their mission. Centre for Info Bio Technology (Regd. No. SH/311R/2-16AP/42/09) is a scientific research, publication and promotion based organization located at Jaipur (India). It was established in 2008 with a vision to use and apply science and technology, particularly Information Technology, for the benefit of Students, Scientists, Science and Society. Research Project: CIBTech has initiated scientific projects at its research centre from 2012. It aims to indulge upon some fundamental and applied aspects of research in science and technology. In coming years we are planning to collaborate our R&D section with various scientific bodies around the world. 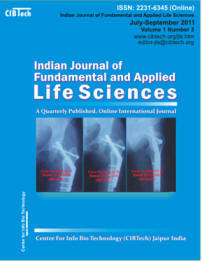 Journal Publication: CIBTech is currently publishing 16 online international journals, covering basic and applied aspects of Life Sciences (JLS); Chemical Sciences (JCS); Engineering Sciences (JET); Food, Agriculture and Veterinary Sciences (JFAV); Geology, Earth and Environmental Sciences (JGEE); Medical Sciences (JMS); and Physics and Mathematical Sciences (JPMS) and so on... Via these Journals we promote researchers to get their quality work processed and published speedily. 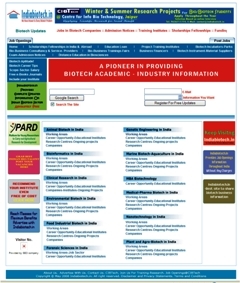 Science Promotion: CIBTech is running www.indiabiotech.in which is India's premier bioscience website, since 2008. The website addresses every current and emerging issue associated with life sciences and biotechnology sector, providing comprehensive and updated career oriented industrial and academic information in Indian perspective. "CIBTech: Science For Social Cause"